Bio Notes: Robert Matheson was born on 15 (some sources give 18) August 1808 in Tain, the son of James Matheson, cabinetmaker and his wife. It is not known where he was first apprenticed, but in 1828 he was appointed junior clerk in the Edinburgh Office of Works by Robert Reid. As his appointment had not been ratified by the Lords of the Treasury, the Barons of the Exchequer and the Surveyor General of the Board of Works, Major General Stephenson, he was not entitled to compensation when the office was re-organised on a reduced basis and he became redundant on 1 April 1840. A single payment of £60 was made. 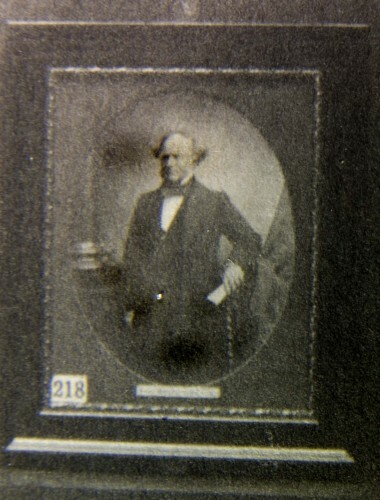 In September 1840 William Nixon, appointed Clerk of Works for Scotland on transfer from Dublin in April 1840, found that the surviving second clerk, James Miller, had been guilty of serious mismanagement, and the Office of Woods and Forests instructed Nixon to offer his post to Matheson. Early in March 1848, when Nixon became seriously ill, Matheson was appointed temporary head and remained so after Nixon's death on the 24th. Although some half-a dozen Scottish architects in private practice applied for the post, the Chief Commissioner for HM Woods and Forests nominated Matheson as Clerk of Works for Scotland on condition that he sat an examination set by James Pennethorne, William S Inman and John Phipps, which he failed 'more especially as regards construction' and he reverted to being second clerk. But after some months he was appointed interim head clerk and after holding the post satisfactorily for a year he became permanent Clerk of Works for Scotland and retained that post when the Woods and Forests became the Office of Works by Act of Parliament in October 1851. For his first eight years in office Matheson’s role was relatively low key, largely confined to executing Edward Blore’s designs for Glasgow Cathedral, completing Nixon’s work at St Andrew’s University and Playfair’s at the Advocates’ Library and looking after the cathedrals and ancient monuments then in the Office’s care: much of this was under the general supervision of William Burn who held the position of Consulting Architect to the Government in Scotland. But by 1855 Matheson had sufficiently gained the confidence of his London masters to be entrusted with extensive works at Holyroodhouse, proposals for new buildings at King’s College Aberdeen in which Burn still had a role, and the building of the New Palm House at Edinburgh’s Royal Botanic Garden. Built in 1855-59 the Palm House was one of the most impressive structures of its kind in the western world, a bigger and more monumental version of Richard Turner’s at the National Botanic Garden in Dublin. It made his reputation, the high point in his career coming in 1859 when he was allowed to design New Register House and Edinburgh’s General Post Office, successfully resisting London interference in the design of the former. The Record Office was even more innovative then the Palm House, very accomplished High Renaissance elevations enclosing a cast-iron book stack with a domed central area modelled on Pennethorne’s Round Room at the Public Record Office in London while the Post Office made the most of a difficult site where more than half the building was below street level. With these projects his authority had grown to the point of being able to propose a redesign of Francis Fowke’s elevations for the Chambers Street museum in a Vignola-like High Renaissance idiom, but in the event he had to execute the building as Fowke designed it. With the passing of the Courthouses Act of 1860 Matheson’s post took on an important supervisory role. Selection of an architect still lay with Commissioners of Supply but Matheson now advised on both requirements and appointments. Throughout the 1860s and 1870s the main business of his office consisted of a series of provincial post offices, all in an astylar subdued Italianate. These culminated in the vast Barryesque palazzo of Glasgow’s General Post Office, his largest project built in 1875-78. Matheson had a small private practice separate from his official duties. Between 1859 and 1870 he undertook the restoration of the Collegiate Church of St Duthes (or Duthac) in his native Tain for which he took no fee. His largest private project was his own: sometime before 1863 Matheson appears to have inherited considerable wealth. In June of that year he purchased nine acres at West Coates from the Heriot Trust and proceeded to form Grosvenor Street and Lansdowne Crescent specifying elevations which he himself had designed. The northern area was hived off to Peddie & Kinnear who developed Grosvenor Crescent in association with the adjoining property on Palmerston Place which they had acquired from the Walker Trust. Matheson married Alexa Urquhart and lived in some style at 25 Abercromby Place. He died in office on 5 March 1877, and was buried in Dean Cemetery. 1857 Parliament House, Supreme Courts of Scotland Edinburgh Scotland Law Room. Redesigning and completion of Brown's scheme, with Matheson as architect for Scotland in the Office of Works.